Andrew and family at Blacksod Memorial Garden. 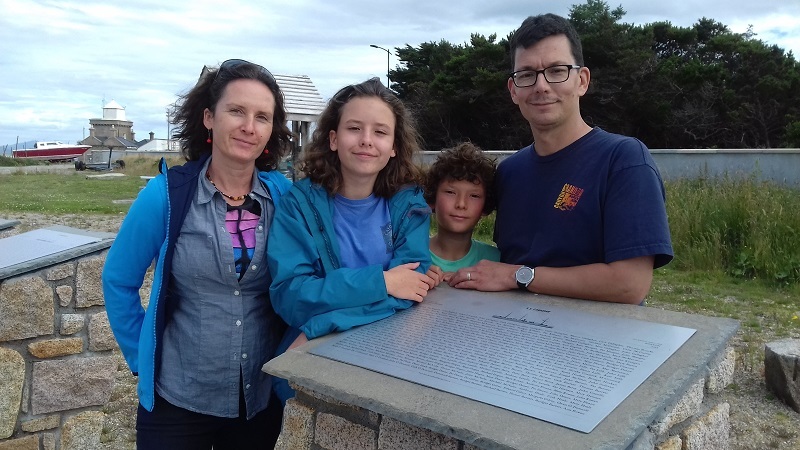 Dominick Barrett with his wife Bridget and children Michael 9, Honor 7 and Bridget age six months, lived in the townland of Barhauve, near Belmullet. Bridget was formerly Bridget Meenahan from Gortmellia. The Barrett family emigrated on the SS Canadian 13th April 1884, the first of four sailings that departed in 1884 directly from Blacksod Bay. The destination stated on the ship’s manifest was to Delaware, Ohio. After they arrived at the Port of Boston on the 24th April, the family continued on their life changing journey. On the 1900 United States Census, the Barretts were still living in Delaware, Ohio. Andrew Paul and family travelled from Washington D.C. back to the Mullet Peninsula, the homeplace of his ancestors. Bridget (Bridgie) Barrett, age just six months, onboard the sailing of SS Canadian, was Andrew’s Great Grandmother. 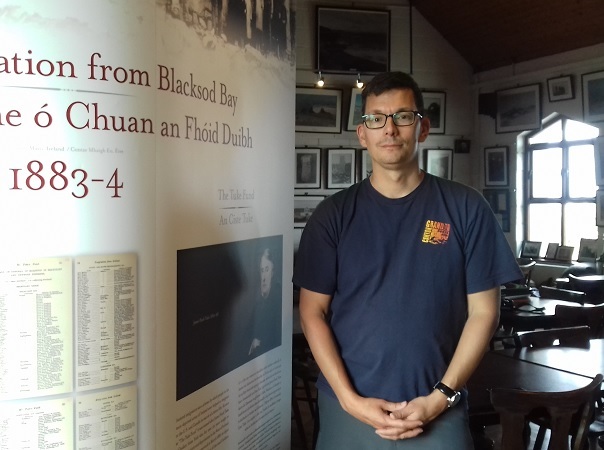 Andrew at Ionad Deirbhile Heritage Centre Eachléim, Blacksod. The ‘Mullet Peninsula’ is the Kilmore Erris, Church Parish, Diocese of Killala. ‘Mullet Peninsula’ Civil Records come under the Belmullet District. Also on the same boat headed to Delaware, Ohio was Bridget Rowan (although she is listed as Ann), age 17. She was traveling to meet her brother Michael Rowan (my 2x great-grandfather) and his father already in Delaware. The Rowans and Barretts lived in Delaware, worked for the railroad and worshipped at St Mary’s. I have discovered some DNA matches between this Barret family and my Rowans…trying to sort out the Barretts around Belmullet.